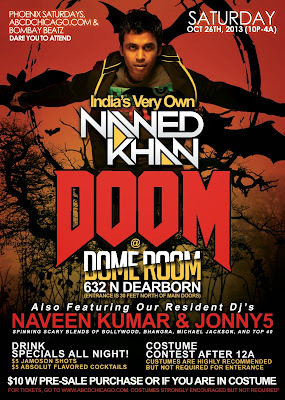 ABCDchicago: DOOM @ the Dome Room HALLOWEEN w/ India's DJ Nawed Khan! 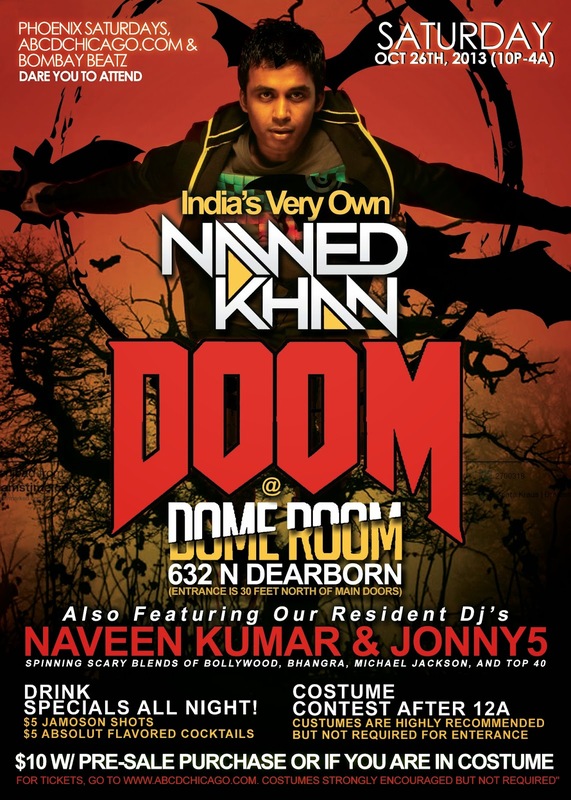 DOOM @ the Dome Room HALLOWEEN w/ India's DJ Nawed Khan! Phoenix Saturdays, ABCDChicago.com and Bombay Beatz proudly present..
Special guest, India's celebrity DJ - Nawed Khan for HALLOWEEN 2013! DJ Nawed Khan is one of the biggest names in an ever changing and emerging DJ scene in India. A resident DJ at Submerge Bombay which is managed and promoted by MTV's Nikhil Chinapa. A resident DJ at Dubai's latest hotspot 'Pulse' and a regular feature in clubs around India and South East Asia, Nawed has played across 5 continents. He's also the the only Indian DJ to have performed with international heavyweights like Swedish House Mafia, Tiesto, Paul Van Dyk, Axwell, Roger Sanchez, Markuz Schulz, Sander Van Doorn. Come and join us for the BIGGEST Bollyween bash in the Mid-West at the hottest nightclub in Chicago - Castle!